Large, ivory cups, lemon scented, in May & June & sporadically all summer & fall. 6” long leaves, waxy green on top and silvery-frosted beneath. In fall fruits open to reveal bright red seeds. Magnolia named for Pierre Magnol, Montpellier professor of medicine and director of the botanic garden. (1638-1715) This species collected by Rev. John Banister in Virginia c. 1690. 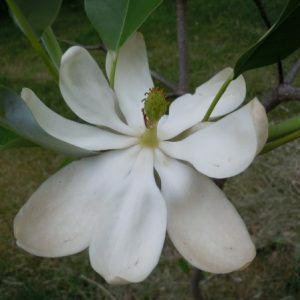 One of the mainstays of John Bartram’s seed business, Peter Collinson, Bartram’s agent in England, said, “the name Magnolia will sell a box of seeds.” Offered for sale in Bartram Garden’s 1783 Broadside, America’s 1st plant catalog. Pressed specimen in Emily Dickinson’s herbarium. Showy yellow flowers in spring followed by pretty blue fruit with red pediciles. Holly-like, evergreen leaves turn purple in fall for a four season ornament. Showy yellow flowers in spring followed by pretty blue fruit with red pedicles. Holly-like, evergreen leaves turn purple in fall for a four season ornament. 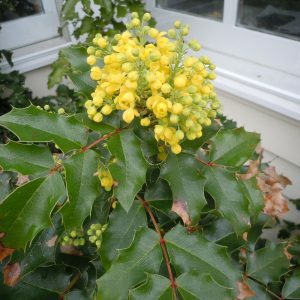 Mahonia is named in honor of Bernard McMahon, Scottish nurseryman who immigrated to Philadelphia around 1802. 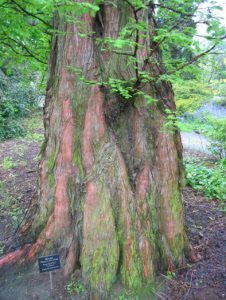 In 1818 Thomas Nuttall extolled McMahon “whose ardent attachment to Botany, and successful introduction of useful and ornamental horticulture into the United States, lays claim to public esteem.” McMahon’s nursery received plants discovered by Lewis & Clark who collected this plant in April 1806 along the rapids of the Columbia River. The Snohomish ate the berries and made a yellow dye from its roots. It cured bloodshot eyes and kidney disease for the Okanagan-Colville. California’s Karok Indians boiled the root and drank the liquid to cure numerous ailments. Steamed roots and leaves believed to remedy yellow fever.